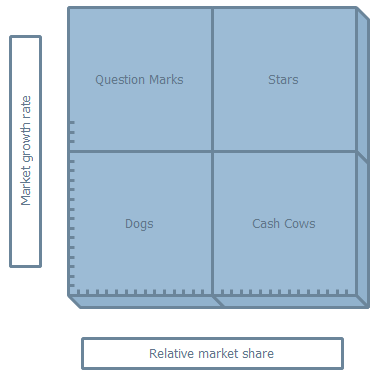 For all kinds of products or services, the growth share matrix offers an easy to understand diagram of the product (or service) strengths and weaknesses visually and clearly, at least from the perspective of current profitability, as well as the possible cash flow. You can have a better understanding of this tool in this article. Edraw has prepared everything you need to construct a growth share matrix, you just need to drag them onto the canvas and layout them. First of all, a brief introduction of this tool is given below. The growth share matrix is also called product portfolio, BCG-matrix, Boston matrix, Boston Consulting Group analysis and portfolio diagram. It refers to framework first developed by the Boston Consulting Group (BCG) in the 1960s to help companies consider the priority (and resources) that they should give to their different businesses. It is also known as "a business tool, which uses relative market share and industry growth rate factors to evaluate the potential of business brand portfolio and suggest further investment strategies." The diagram puts each kind of a company's businesses into one of four categories represented by four quadrants in it. The four categories were given memorable names - cash cow, star, dog and question mark. Thus, it aids managers to compare different fields of businesses visually and have strategic decision and action in the competitive market. The X axes of the matrix represents relative market share (the ability to generate cash) and the Y axis stand for growth (the need for cash). It was commonly believed that one of the main indicators of cash generation was relative market share, and one that pointed to cash investment was that of market growth rate. Relative market share is the ratio between the company's market share and its largest competitor's market share as seen in the following equation. Cash cows are businesses with a high market share generating lots of cash but having low growth prospects. They require a low need for cash and are often in mature industries that are about to decline. Stars stand for businesses that have high growth potentials and a high market share. Question marks represent the fields marked by high growth prospects but a comparatively low market share (and have also been known as wild cats). Dogs, by deduction, are low on both growth prospects and market share. The conclusions drawn from such an analysis are to transfer the surplus cash from a conglomerate's cash cows to the stars and the question marks, and to close down or sell off the dogs. In the end, question marks reveal themselves as either dogs or stars, and cash cows become so drained of finance that they inevitably turn into dogs. It is well-said by Bruce Henderson: "To be successful, a company should have a portfolio of products with different growth rates and different market shares. The portfolio composition is a function of the balance between cash flows. High growth products require cash inputs to grow. Low growth products should generate excess cash. Both kinds are needed simultaneously." The need which prompted this idea was, indeed, that of managing cash flow. The general goal of this analysis is to help find out, which brands the firm should invest in and which ones should be divested. Every coin has two sides. It is very necessary to learn both merits and demerits of the tool in order to make the best of it. The advantages lie in several aspects. To begin with, it is truly helpful for managers to evaluate balance in the current portfolio of four categories in a simple and easy to understand way. Secondly, it is applicable to large companies that need volume and experience effects. Then, it offers a base for strategic management in the future. Last but not least, if a company is capable of using the experience curve to its advantage, it will be able to produce and sell new products at a price that is low enough to get early market share leadership. Once it becomes a star, it definitely will be profitable. Speaking about the demerits, the first thing to point out is that this schema may result in misjudgment. It may lead managers to judge that businesses are to be treated as cash cows when they are actually stars. Secondly, the growth share matrix has been strongly criticized for persuading companies to focus too obsessively on market share. In a world where markets are increasingly fluid, high market share is not the only success element and there are many other elements besides market growth should be considered as indicators for attractiveness of a market. Sometimes Dogs can earn even more cash as Cash Cows. Similarly, a high market share does not necessarily always lead to earnings. Finally, this model uses only two aspects - market share and growth rate. This may tempt management to emphasize a particular product, or to divest prematurely. You are only a few steps away from desired results using our software. The Detailed instructions are listed below. 1. Start Edraw; click Business Matrix in Template Categories list. 2. 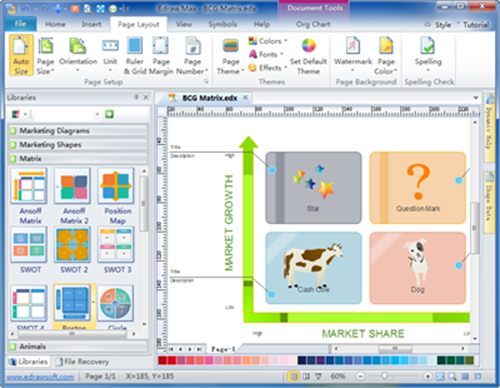 Click Create to open a blank growth share matrix drawing page. 3. Drag and drop the suitable Matrix shape onto the page. 4. Type in the text. Label the top left quadrant "stars." Label the top right quadrant "question marks." Label the bottom left quadrant "cash cows." Mark the last quadrant "dogs." 5. Click Libraries on the left of the page, choose Illustration and then select Animal to add pictures of cow and dog. Likewise, you can find clipart of star and question mark in the Symbol Category of Illustration. Alternatively, you can smartly give full play to our customizable growth share matrix templates. It will save you 3 of the above 5 steps leaving the customization step as the major requirement. 1. Choose Business Matrix in Template Categories list; double click to open the BCG Matrix example. 2. Add your description in the Callout shapes and format the diagram in your own way. 3. Save or export the diagram as you wish. To see examples of this solution, please go to the expandable link Boston matrix example. The beneficial features are beyond your expectation and will lead to impressive results. Edraw has included various templates and examples so that you can easily handle quick creation and save precious time. It boasts with the seamless integration with MS Office bringing easier output and better collaboration in your work. All shapes and clipart are design in vector format, so your growth share matrix will never become blur however you change its size. To download this awesome program, click here.